It was a popular vow of apprehensive Democrats in 2004, a pledge made in the heat of battle to move to Canada if George W. Bush was re-elected. Turns out, some of them did. An analysis of immigration statistics done by the Montreal-based Association for Canadian Studies showed the number of Americans who moved to Canada in 2006 hit a 30-year high, almost double the number who moved north in 2000 when Bush was elected for a first term as U.S. president. The analysis also showed the southward brain drain is being narrowed somewhat, and most of the American migrants are highly educated people who may be moving to Canada for quality of life and social reasons. The numbers were not huge – 10,942 Americans moved to Canada last year, far smaller than the influx predicted when bogus maps of the United States of Canada began hitting the Internet in the waning days of the 2004 campaign. The day after Bush was re-elected president, there were 191,000 hits on Canada’s immigration website, six times its average traffic, most of it from the U.S.
Websites sprouted explaining the mechanics of the Canadian immigration system, and Canadian women, tongues in cheek, offered to marry anti-war Americans. But the increase is symbolic, said Jack Jedwab, the executive director of the association that analyzed the statistics. “Given that most of these immigrants are university-educated or better, you can assume they can find work in the U.S., so the move must be based on other reasons,” Jedwab said. 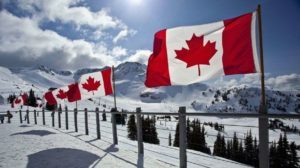 Citizenship and Immigration Canada reported that 49.5 per cent of the Americans who migrated to Canada in 2006 had at least a bachelor’s degree. Jedwab said anecdotal information points to politics, health care, social issues, possibly even the strengthening Canadian dollar as lures northward, he said. For 34-year-old labour organizer Tom Kertes, the move last April from Seattle, Wash., to Toronto was based on human rights. “The words `human rights’ are foreign words in the U.S.,” Kertes said. He moved to Toronto with his partner Ron Braun and the two plan to marry, something they could not do in Washington state. He also cited the war in Iraq and the torture of Iraqi prisoners by Americans – and the failure of the Bush administration to clearly disavow such practice – as contributing factors to what is a major decision. “Moving countries is not done lightly,” he says. He said he found the tolerance of Toronto welcoming and he thought Canadians were proud of their reputation for tolerance. The 2006 figure marks the first time there have been more than 10,000 American migrants to Canada since 1981 and was the highest number since 1977. Between 1967-75, a period marked by draft dodgers fleeing the Vietnam War, there were at least 19,000 Americans who fled north each year. While the number of Americans moving north jumped, the number of Canadians moving to the United States declined to 23,913 in 2006 from 29,930 in 2005. The net loss to Canada of 12,971 was the smallest since 2003 and slightly more than half of the loss suffered by Canada as recently as 2001 when 24,089 more Canadians moved south than Americans moved north. The two largest categories of U.S. immigrants were the family class and economic class and Jedwab says he believes the numbers will continue to rise because of the family class of immigration. “Once you reach a certain critical mass, the family reunification numbers tend to keep the numbers increasing,” he said. There was a large jump in the number of American refugees in 2006, but those were largely Haitians who received refugee status in the United States then moved to Canada. Ontario – particularly the GTA region – was the destination of more than half of the U.S. migrants, far outpacing British Columbia and Quebec, the second and third most popular destinations. Perhaps the most surprising aspect of the study is the attention it has received in the United States where it was first reported by abcnews.com. It has become a hit on the blogosphere where many Americans have reacted with venom to those who have left the country and some 80,000 persons voted on whether they would move to Canada within hours of the question being posted on an aol.com site. “If every American who didn’t like George W. Bush left the country, there would be no one here but illegal immigrants,” one blogger wrote.